Consumption of sugary drinks may lead to an estimated 184,000 adult deaths each year worldwide, according to research published today in the journal Circulation and previously presented as an abstract at the American Heart Association Council on Epidemiology and Prevention in 2013. "Many countries in the world have a significant number of deaths occurring from a single dietary factor, sugar-sweetened beverages. It should be a global priority to substantially reduce or eliminate sugar-sweetened beverages from the diet," said Dariush Mozaffarian, M.D., Dr.P.H., senior author of the study and dean of the Friedman School of Nutrition Science & Policy at Tufts University in Boston. "Some population dietary changes, such as increasing fruits and vegetables, can be challenging due to agriculture, costs, storage, and other complexities. This is not complicated. 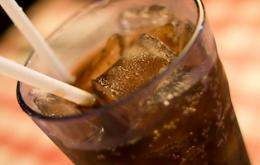 There are no health benefits from sugar-sweetened beverages, and the potential impact of reducing consumption is saving tens of thousands of deaths each year," Mozaffarian said. The impact of sugar-sweetened beverages varied greatly between populations. At the extremes, the estimated percentage of deaths was less than 1 percent in Japanese over 65 years old, but 30 percent in Mexican adults younger than 45. Of the 20 most populous countries, Mexico had the highest death rate attributable to sugar-sweetened beverages with an estimated 405 deaths per million adults (24,000 total deaths) and the U.S. ranked second with an estimated 125 deaths per million adults (25,000 total deaths). In nations of the Caribbean and Latin America, such as Mexico, homemade sugary drinks (e.g. frescas) are popular and consumed in addition to commercially prepared sugar-sweetened beverages. "Among the 20 countries with the highest estimated sugar-sweetened beverage-related deaths, at least 8 were in Latin America and the Caribbean, reflecting the high intakes in that region of the world," said Gitanjali Singh, Ph.D., lead author of the study and a research assistant professor at the Friedman School. Overall, in younger adults, the percent of chronic disease attributed to sugar-sweetened beverages was higher than the percent in older adults. "The health impact of sugar-sweetened beverage intake on the young is important because younger adults form a large sector of the workforce in many countries, so the economic impact of sugar-sweetened beverage-related deaths and disability in this age group can be significant. It also raises concerns about the future. If these young people continue to consume high levels as they age, the effects of high consumption will be compounded by the effects of aging, leading to even higher death and disability rates from heart disease and diabetes than we are seeing now," Singh said. More information: Singh GM, Micha R, Khatibzadek S, Lim S, Ezzati M, and Mozaffarian, D. "Estimated global, regional, and national disease burdens related to sugar-sweetened beverage consumption in 2010." Circulation. Published online ahead of print 06-29-15. To be clear, this study does not at all show that consuming sugar-sweetened beverages causes chronic diseases. As the authors themselves admit, this is an attempt to estimate the effects of sugar-sweetened beverage consumption. However, attributing intake of these products to death is not rooted in science, and the authors' conclusions are unsubstantiated to say the very least. In sum, our industry's products are safe, and our member companies are doing their part to offer consumers' fact-based information and the beverage options they need to make the right choices for themselves and their families.